Without question, John Byrne's run on Sensational She-Hulk made for some of the wackiest, most entertaining reads you'll ever find. Long before Deadpool was even a smart-assed twinkle in Rob Liefeld's Levi 501 button fly jeans, Byrne had Jennifer Walters gamma punching her way through the fourth wall and starring in some of the greatest "WTF" moments in comics. 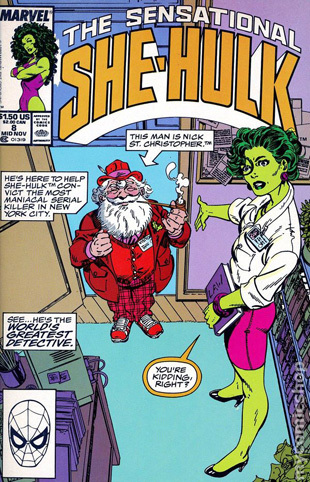 Case in point: that time She-Hulk teamed with Santa Clause to bring a serial killer to justice. During her stint as a New York Assistant District Attorney, Jen is assigned to prosecute a man on seven counts of murder. The only problem is that the evidence against him his all circumstantial. With just 48 hours to come up with something solid, she's approached with an offer of help by a familiar looking bloke by the name of Nick St. Christopher, the world's greatest detective. After a bit of globe-trotting, chimney diving, and even a visit from Santa ... er ... "Nick's" other half, Jen's holiday adventure ends with the case all wrapped up.